The dainty blossoms of dicentra–bleeding heart–droop from lacy leaves against a deep, mysteriously heathered green. This seamless yoke cardigan is knit in the round, with steek for the front opening. Full instructions for securing and cutting the steek are included in the pattern. Waist shaping and 3/4-length sleeves emphasize the feminine look of this sweater, and its light weight makes it an all-season garment. 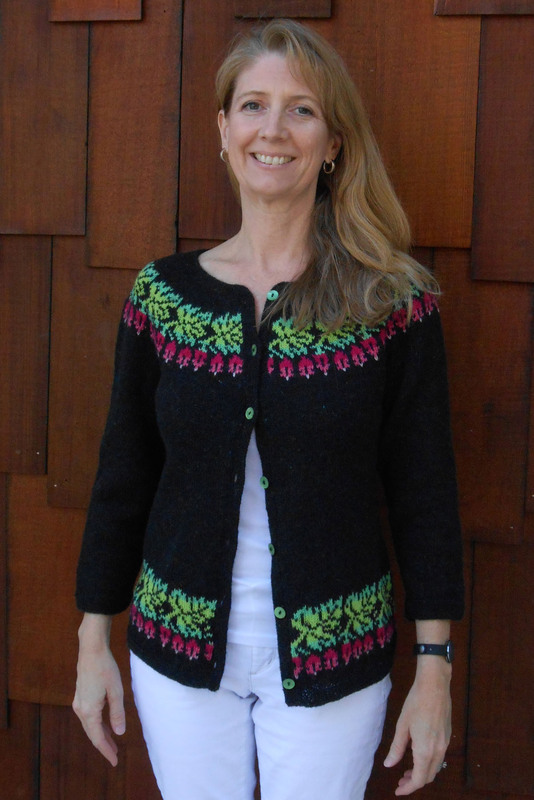 The Dicentra Cardigan pattern is written for 6 sizes: 33.5″, 37.5″, 41.5″, 45.5″, 49.5″, and 53.5″ bust measurement. 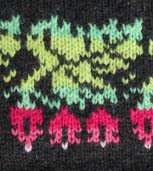 Six colors are used in this design: 1400 Mirry Dancers is the main color, and 3 shades of pink plus 2 shades of green are used to knit the asymmetrical design at hips and yoke. Knitting this sweater is quite straightforward. 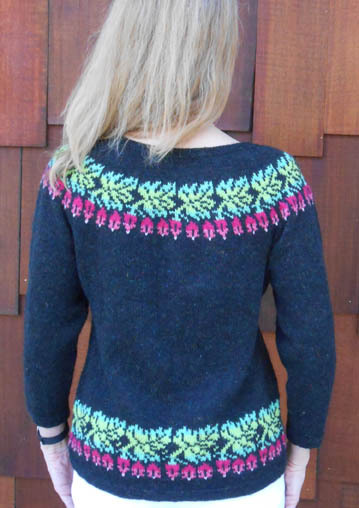 There are two challenges: the steek (instructions are included in the pattern) and placing the buttonholes (instructions are not included in the pattern–I recommend Knitting with Two Colors by Meg Swansen and Amy Detjen or any good online reference). Other materials needed: In addition to the standard knitting supplies, you will need 7 5/8” or 3/4” buttons.